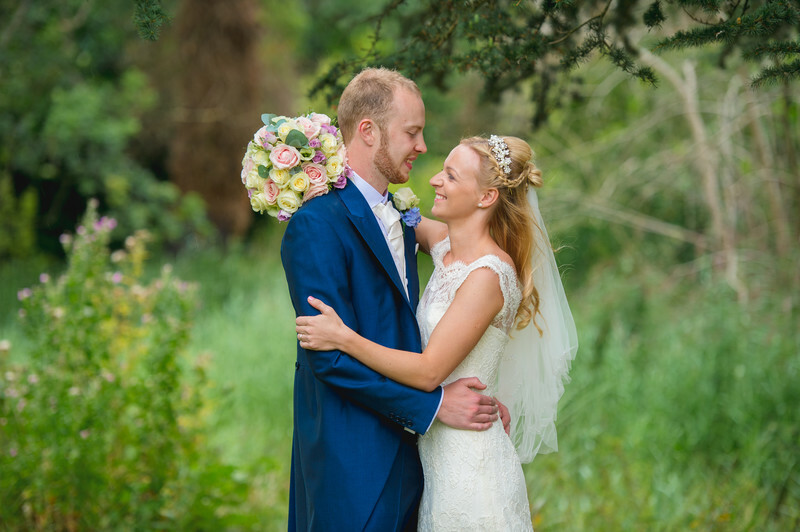 Natalie and Will got married at Manor by the Lake in Cheltenham. Manor by the Lake is a place you really have to visit to appreciate, as describing the venue as it is doesn't do it justice at all. For a start, the venue is within half a mile of a busy main road, and the drive to the venue takes you right past an industrial estate. However (and this is a big however) is that once you're inside the venue, you could literally be anywhere. The perimeter is lined with tall trees and dense bushes, completely masking the exterior from view. For all you know once you're at the venue, you could be in the middle of Hertfordshire and in 500 acres of countryside. As the name implies, the central attraction of the venue is a lake, just in front of the Manor House. Natalie and Will's wedding ceremony took place in bright sunshine, but later that day the weather stared to turn and rain clouds blew in. I managed to take all of the photos I wanted of the formal groups before the rain came down, but had to leave some of the photos of the couple until later in the day. This photo of Natalie and Will in the surroundings of the lake was taken after their wedding breakfast had finished, as we were waiting for the evening guests to arrive. Luckily the rain had stopped and the evening sun was being diffused by the heavy clouds still overhead. The rain from earlier that day had really brought the colours out in everything, and the greens of the trees and grasses was as vibrant as it could be. I knew for this simple photo, I wanted to frame the couple against this sea of green, so chose to shoot this image with a long lens and a wide aperture, which would make the background out of focus, creating this smooth green palette you see here. I particularly like how I managed to use darker elements of the background to frame the couple - with the darker greens from various trees and bushes helping focus your eye on the middle of the image, and on the bride and groom. This has become my signature pose for couples photos, as it perfectly shows off the wedding dress, groom's suit, groom's buttonhole flower as well as the wedding rings and bridal bouquet too.